Kohli and Dhoni end the match in style! Kohli hits Irfan for four, Dhoni goes one better with a six and then claims the winning single. The hosts are back in the tournament in style, with a win against their fiercest rivals. We have cheers, fireworks and huge smiles at Eden Gardens, with Sachin Tendulkar the head cheerleader waving a huge India flag. India are back in this tournament in style! They have won this game at a canter in the end. Kohli smashes a four, Dhoni goes one better with a six before then getting the match-winning single. Huge cheers, fireworks, big smiles. What a different picture from 10 overs ago. To think, just a few overs ago, India were seriously rocking. What a different atmosphere we have now at Eden Gardens. Afridi has bowled out. The skipper has been unable to rescue his side. India need 13 off 18. And they have two of the coolest customers in the game at the crease. What a player this lad is. He brings up his 50, off 34 balls, with a four and a single. He is winning this game for India. Mohammad Amir is back, with one remit - dig Pakistan out of a hole. But Kohli has kept his head superbly during this innings, even when others were losing theirs. And he and Dhoni steer four singles before the former ends the over with a luscious drive for four. Timing, placement, class. "Kohli is up for this. He's such a classy batsman. This is a difficult wicket to bat on but he's making it look easy." The wicket may have checked India's progress but it doesn't halt it. Kohli, carried by the huge cheers that greeted the arrival of MS Dhoni as his partner, drives Afridi for four. Dhoni, who casually hasn't bothered with a helmet, gets off the mark with a single. Only wickets will rescue Pakistan now. "That wicket might be a little bit late for Pakistan - they are going to have to do something special to win from here." Is this too little, too late for Pakistan? Yuvraj looks to fire another one on the pull but doesn't quite catch it and is caught by Mohammad Sami just in front of the rope at cow corner. The noise is deafening. Yuvraj rocks back and plants a short Wahab ball over cow corner for six. These two are winning it. "This partnership between Kohli and Yuvraj is keeping India in the competition." The noise is deafening. Riaz digs one in short and Yuvraj rocks back and cleanly smashes one over cow corner for six. These two are winning it. 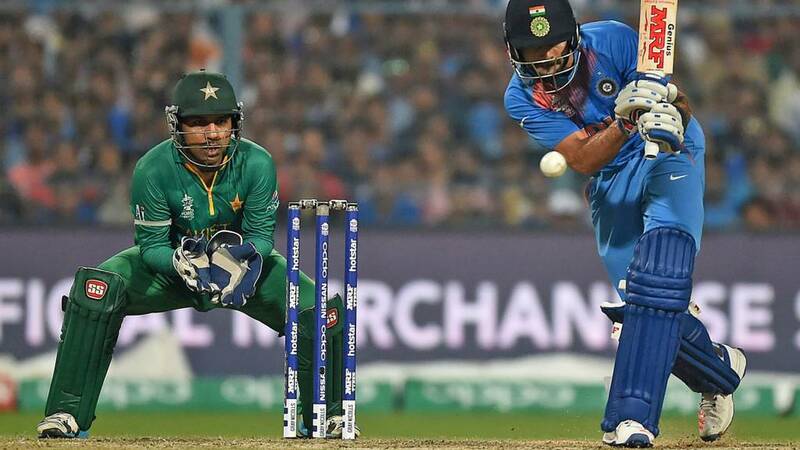 A brilliant over for India, all thanks to Kohli, who adds to his earlier six off Malik with a whip-punch in front of square for four. The crowd are on their feet as the 150th tournament six is swept over backward square by Kohli. India are wrestling back control. Pakistan go for a change of pace, turning to Wahab Riaz. But Kohli responds by pulling his first ball flat over midwicket for four. Wahab hits back, though, and restricts India to just two more runs. Steadily, these two batsman are grinding their side back into contention. "India starting to look much healthier now with these two playing well. There haven't really been any fireworks but they've kept the score ticking over." The scoreboard requests that fans 'make some noise'. I think they're too busy chewing their nails. There are a lot of knees bobbing nervously on the Indian bench. Shoaib Malik continues the spin assault and gets a few to grip and turn dramatically. India are still able to take him for eight. A good response from the hosts. The win predictor gives India 77%. Hmmm. Afridi is getting it to dart and nip, slide and spit. India prepared this surface but Pakistan are enjoying it more at the moment. Kohli and Yuvraj are smuggling singles whenever they can.